Sometimes I obsess and obsess over a recipe I want to try until it reaches a boiling point, and I just have to bake it to find out what it tastes like. This is what happened with this cake. I thought about scaling the recipe down given that it was probably only going to feed a few mouths, but I haven’t been baking very much lately, so why not? I didn’t go overboard with the decorations, either, because it was really only for personal consumption, and it was late night by the time I finished the frosting. Last year, I baked an Apple Cake that I found to be quite good. This recipe uses 4 cups of applesauce (!!!) in the place of any liquid dairy, which also helped to cut down on some of the grunt work of peeling/cutting apples. The cake is also topped with a cooked flour frosting that I’ve attempted only once before. 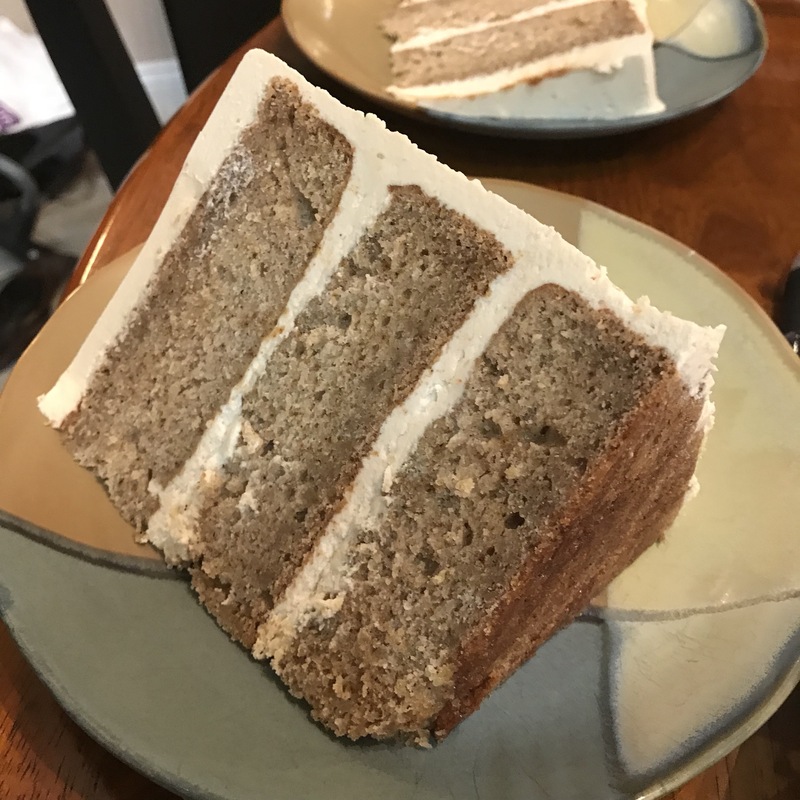 The cake tastes a spice cake, especially given the quantity of allspice and cloves in the batter. I think this masks the apple, however, and I think it might be improved by increasing the cinnamon to a tablespoon. My wife, who is usually anti-spice, did not believe I should mess with the spices at all. 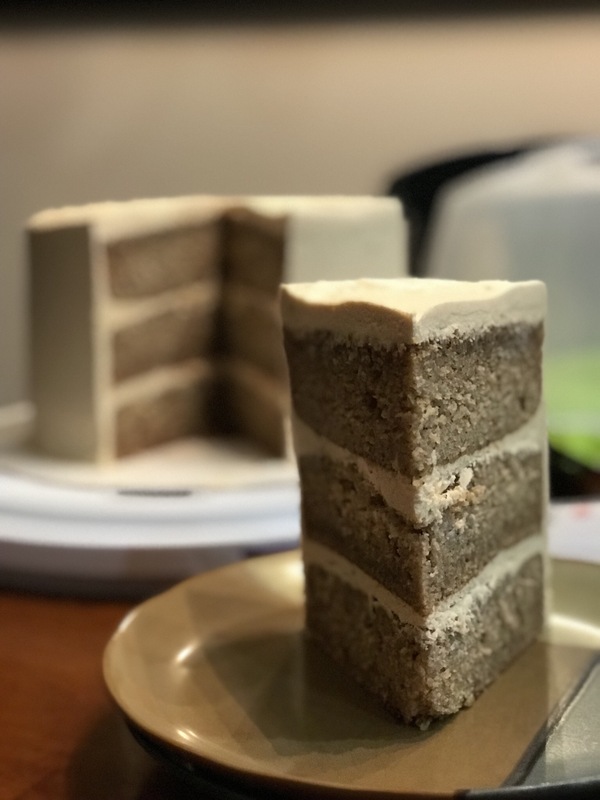 The cake is fairly easy to assemble and bake, however, upon cutting into it, I noticed some “gluey streaks” that I’ve seen in some of my other cakes. According to this blog post, I most likely over-creamed the butter. It’s not even close to inedible, but I feel like it could have been better. The original recipe calls for four minutes of creaming plus another three minutes once the sugar is added, which seemed excessive at the time, and I’d probably reduce it considerably. I did have some trouble with the first salted caramel recipe that I used. The caramel met and exceeded the appropriate temperature but was still super liquidy. I’m not sure what I did wrong, except that there might have been too much liquid in the recipe? To be fair, the recipe is for a caramel sauce and not just caramel, although this might have also been the reason some commenters complained of a runny frosting. Using this salted caramel recipe, which is more viscous, I did not experience a runny frosting at all. The frosting is way better than the cooked flour mint frosting I tried previously, which lacked butter. The addition of butter to this frosting recipe makes the frosting taste very similar to a Swiss meringue butter cream without the hassle of cooking egg whites. It is lighter and creamier than most American buttercream recipes. 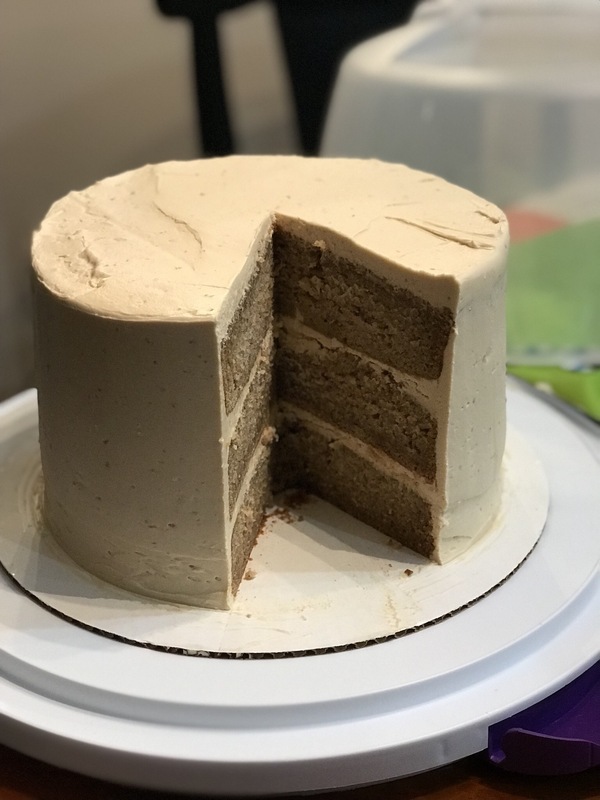 I decided to add a little more salted caramel because I thought it needed an extra boost of flavor above and beyond the 1/3 cup in the original recipe. 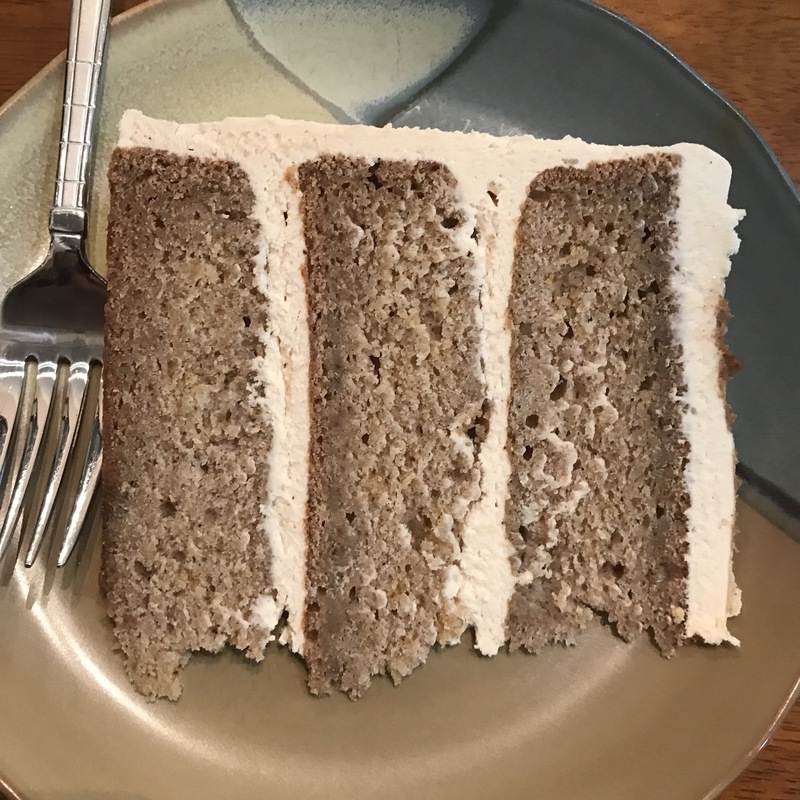 The frosting may be the best part of this cake recipe, especially paired with the denser, apple-flavored cake. For the salted caramel sauce: In a medium saucepan, heat sugar over medium heat, stirring constantly until sugar is completely melted and amber-colored. Once sugar has melted, add the butter and stir with whisk until completely melted (~2-3 minutes). Slowly drizzle in the heavy cream while stirring, then allow mixture to boil for 1 minute. Remove from heat, stir in salt, then set aside to cool to room temperature. For the cake: Heat oven to 350 degrees. Prepare three 8″ round cake pans. In a large bowl, sift flour, baking soda, baking powder, salt, cinnamon, allspice, and cloves. In the bowl of a stand mixer with paddle attachment, beat butter on medium speed for 4 minutes. Add the sugar, then continue beating for 3 minutes until light and fluffy. Add the eggs, then beat until combined. Reduce mixer speed to low, then add the dry ingredients in three parts, alternating with the applesauce, beginning and ending with the dry ingredients. Scrape the sides of the bowl as needed, then mix for 30 seconds to combine. Divide batter evenly among the prepared pans (~800 g per pan). Bake 45-55 minutes (mine were closer to 50-55 minutes), or until cake tester comes out clean. Cool cakes on a wire rack for 20 minutes before turning out onto the wire rack to cool completely. For the salted caramel buttercream: In a medium saucepan, whisk sugar and flour. Add the milk and heavy cream, then cook over medium heat, occasionally whisking, until the mixture comes to a boil and has thickened (10-15 minutes). Transfer mixture to the bowl of a stand mixer with paddle attachment. Beat on high speed for 5 minutes until cool. Reduce mixer speed to low, then add the butter and vanilla, mixing until incorporated. Increase mixer speed to medium-high and beat until frosting is light and fluffy. Add the salted caramel sauce, and continue beating until combined and fluffy. Chill the frosting as needed to attain desired consistency, if needed. 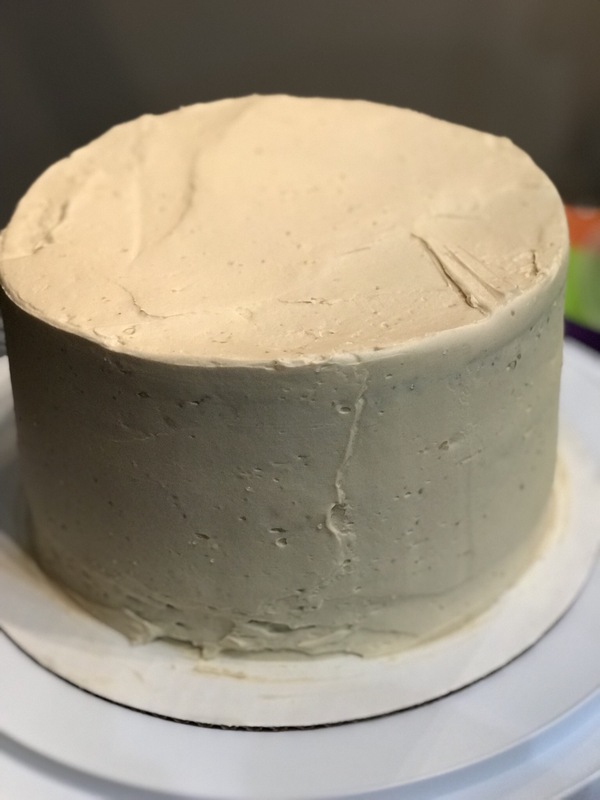 Frost cakes as desired (1 1/4 cups frosting between layers, top with remaining salted caramel sauce).